First I want to wish everyone a Happy New Year and secondly, no resolutions that cannot be kept! I feel so strongly about that, that even my cards for New Years reflect my laid back attitude this year, AND you can read about my "maybe" resolutions for the New Year HERE. The first one is from the sheet of wax paper that I keep in the bottom of my spray box. I just love how the ink sits on top of the wax paper and dries then gets layered with more inks. Over time you can truly create some beautiful papers this way. Next is a paper towel. We all know about blotting up inks from our Dylusional journals and those paper towels can become works of art as far as I am concerned. I do keep seperate towels for blotting up colors that look good together and make sure to stop when they are saturated with just the right amount of color. I also pull the layers of paper towels apart for a more translucent look. This is a bit of tissue paper, crumpled up and used to blot inks colors. The key to good colors here is to not overdo it, the tissue really absorbs the ink. Last, is not my favorite I admit. It's a dryer sheet. Maybe I don't like the muddy colors? It does have great texture but even the acrylic paint soaked into the sheet too much. I'm still trying to find uses for these sheets. I love the play on the authors name. Did you know a feather is a symbols for a new beginning? Very appropo for a New Years card I think. And for my friend Tamiko, who wanted to see the stamp I made, here it is, in all it's painted goodness. It's drawn with Puffy Paint on cardboard. Did you know that Pablo Picasso and Georges Braque launched collage into the mainstream art community in the early twentieth century? Collage is an artistic composition of materials and objects that are glued down onto a surface and it can be as formal, challenging and expressive as painting. Today we are going to let the printed word speak for us. In other words, collect magazines and cut out words or phrases that catch your eye. I am looking for an upbeat tempo here to counterbalance our inner critic page from last week. Once you've collected your words, study them. Look at the different types of shapes and colors. Groups similar words together, then start arranging your words around until you find an arrangement that suits you. On my page, I used 5 words that were printed in red to grab the eye and help focus the eye to the center of the heart. Mt video for this piece can be found over on the Frosted Designs Blog. I hope you get a chance to play along and let your printed words speak for you. I'd love to see what you create. You need to use at least 3 of things that are underlined from the song from The Sound of Music. I used the Printshop cardstock stickers to create a background, which I separated the thanks and outlined it so it would stand out. The printed background paper came from the November Mixed Media Kit and the eye is a Maya Road resin flower. When Flat Susan arrived I set her up in the awesome lodgings of the Smokey Mountain Retreat. A beautiful bed and breakfast Inn where she could enjoy the mountainscapes of North Carolina. The forest straddles the border between North Carolina and Tennessee. Susan said she wanted to get a taste of our southern Appalachian culture. Susan discovered that in North Carolina there are 1,600 growers producing an estimated 50 million Fraser fir Christmas trees growing on over 25,000 acres which represents 90% of all species grown in North Carolina. She was impressed that we are ranked second in the nation in number of trees harvested. They invited her to their clubhouse where she was given the honorary title of the "only girl allowed". They also built a snowman and she loved playing in the snow. Unfortunately, she could not get a grasp of the tire swing, and the boys said she wasn't fit to be a member and they kicked her out of the club because she was, after all....a girl. Susan, dejected and rejected from the boys club, went to visit Santa in the hopes that he would cheer her up. Santa had other plans for Susan and decided that reading 50 Shades of Christmas to her would be thing to get her out of her slump. Susan kept wondering if Santa had a lump of coal in his pocket, or was he just glad to see her?? She could not decide...but he was indeed very jolly! Santa, having claimed that Susan was indeed a very good girl indeed let her ride one of his reindeer. Next, Susan is on her way to visit Kimberley in Davidson, NC where I hope she will have a great time. Today's card is a mixture of stamping and zen dangling. And of course some dimension. 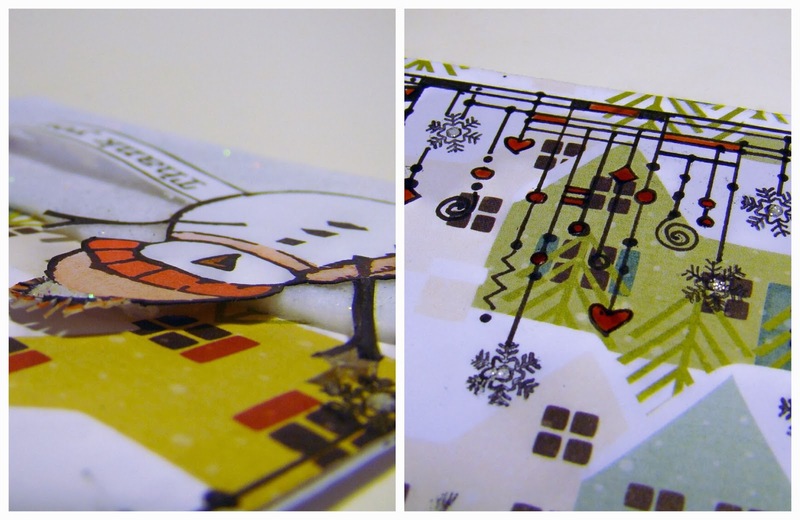 Throughout the year, popping up my cards using Helmar's Liquid Scrap Dots still remains my favorite! I can predict that more zen dangles will make their way onto projects in 2014 as this is a new obsession with me. 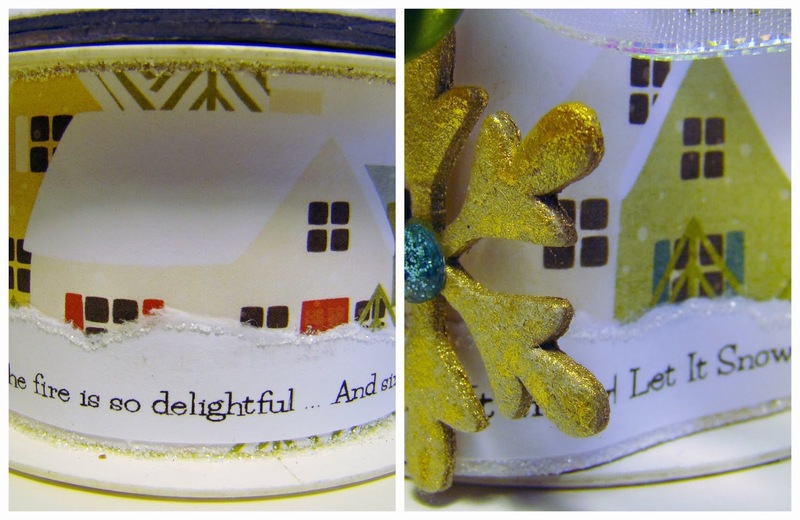 Plus I have finally found a way to use some of those teeny tiny stamps, like these snowflakes that I have dangling. 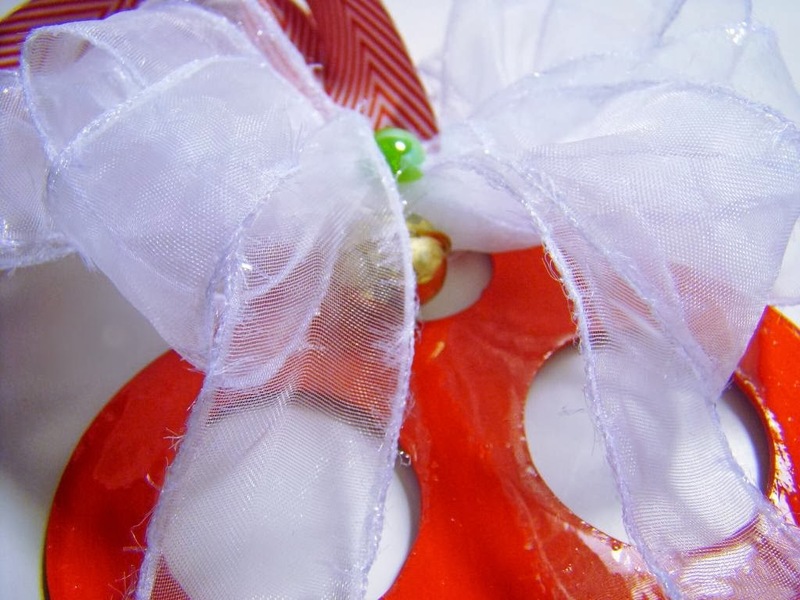 As soon as I saw the inspiration over at Case Study I knew I wanted to use the wax paper from the bottom of my spray box. A lot of you know that I keep wax paper in the bottom so that all the over spray collects there. I love using it in projects and find many ways to incorporate it. The feather is a stamp that I made using puffy paint on top of a piece of card board. I usually use it in my gelli printing but I thought a simple feather floating across the base card would work nicely for a CAS thank you card. I really like how it turned out. It's best defined as having a visual conversation with yourself. This segment is all about tackling the inner critic that resides in our head taking up way too much precious space and defragmenting our self esteem into tiny broken shards. The sad thing, is, we let it. We sit there and listen to all the horrible negative thoughts that it whispers into our ears. And we believe it. I've never understood why we let that happen and have been doing some research on the side as to how to deal with this inner voice. One exercise is to create a visual image of our critic, to even name him, so that when we hear these words that tear us down, we are then to imagine our picture that we created and talk back to it. We are suppose to stand up to the voice that wants to strips us of our artistic realm and buries us in common place mediocrity. This is mine and his name is Schnoz, I am sure you can figure out why, lol I was amazed at how effortlessly I was able to do the conscious stream of writing, it literally flowed from my heart rather than from my brain about the negativity that Schnoz likes to project onto me. I also wrote Scnoz a dear John letter and sent him packing. 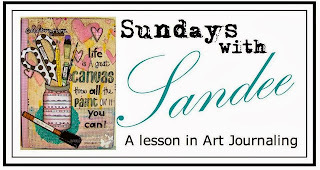 If you want to take a step in evicting your inner critic from your space in your head then please hop over to the Frosted Designs blog for my Sundays with Sandee video where I create my inner critic for you and try to explain stream of consciousness writing. I hope you get something out of this experience. It's time for the December kit reveal over at Frosted Designs and I have to say I have been thoroughly enjoying this kit with all it's shimmery goodness! Here are some glimpses of what I made so far and still have tons of product left to keep making more! This project was all about recycling, the Santa came from my down sizing some Christmas knick knacks, I thought it would be perfect to set atop a recycled jar and fill it with chocolate kisses for a quick and easy gift. ( The Santa was adhered with Helmar's Silicone Adhesive Sealant. ) I wrapped some of the Pink Paisley paper around and sewed some bells to a strip of the paper and then adhered it to the jar with Helmar's 450 Quick Dry Adhesive. 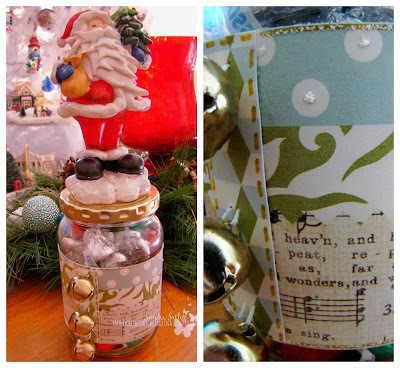 I took all the vellum pieces and made a mixed media angel card out of them. ( You can get the pattern for it over at the Frosted Designs blog ) I also hand sewed the Mode micro beads and embellished her with Ranger's Frosted Lace stickles and the Prima Say it in Crystals. 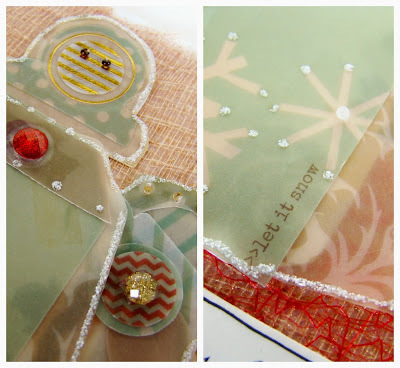 A Zen Dangled card..what fun to make and I love the Susan K. Wecklesser snowman stamp! This is my main project from the kit. A Let it Snow gift box. 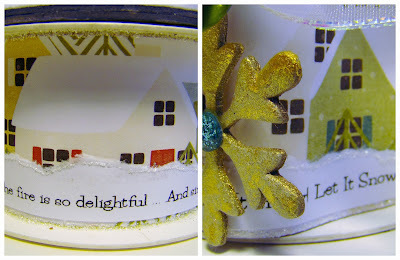 You can see the box in it's entirety over at Frosted Designs, but here is a reminder, to save those ribbon spools after you completed your gift wrapping. They make fun little shaped boxes to give a gift in. Our stockings hang upon a wall. We have no fireplace at all! You see the problem is quite clear. Santa, how will you get in here? We heard a legend. Is it true? Of magic only you can do. and mark it "Santa" so you can see. so you can get inside that night. Thank you Santa, here's our key. The milk and cookies are on me!